This is Portofino on the Ligurian coast - it's between Genoa and the Cinque Terre. Photo taken from the ferry as we entered the port - a group of us from Gorbio on a day trip. 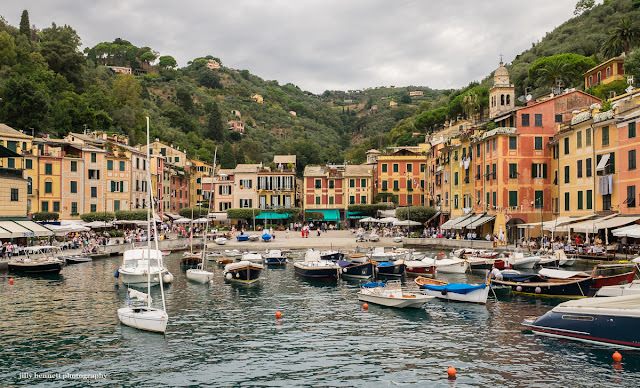 Friends tell me that Portofino is considered the St. Tropez of Italy. Voici Portofino, sur la côte ligure - entre Gênes et les Cinque Terre. La photo a été prise depuis le ferry alors qu'on entrait dans le port - notre groupe de Gorbio en excursion d'une journée. Des amis me disent que Portofino est considéré comme le Saint-Tropez Italien. Love Portofino. Remember being there one Sunny November a few years ago and having coffee, in one of the little cafes on the right of the photo. It was just the two of us , looking out at the sea and the fabulous views. I'd love to visit the place... it does look beautiful. You've captured the charm of this little town.